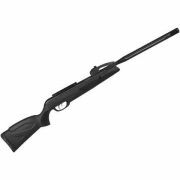 Gamo’s Black 10 Maxxim is a 29 Joules classic-looking airgun composed of a last generation Whisper Maxxim® barrel and a strengthened polymer stock which includes Gamo’s 10x Quick shot® technology. This exclusive technology relies on a rotary multi-shot magazine which allows the shooter to blast up to 10 shots without touching a single pellet, improving the user’s autonomy, reducing reload timings and providing a more dynamic, agile and satisfying hunt. This airgun is also including a two-stage CAT™ adjustable trigger which guarantees a smooth and custom shooting, a last generation recoil reduction system (RRR™) which increments and protects the lifespan of the scope.